This one has been on my I’ll-Get-Around-To-It-Someday list for quite a while. It’s an Australian series set in the 1920s and is quite enjoyable. Miss Phryne (pronounced Fry’ nee) has returned to Melbourne after a long absence touring the world. In the first episode, she’s drawn into a thrust into a … she forces her way into the investigation of her friend’s husband’s murder. Along the way she meets a pair of communist taxi drivers, a maid afraid of electricity, and the local constabulary. In the second episode, Phryne investigates a death on a train and picks up a ward named Jane (also the name of Phryne’s missing (dead?) sister. The death of the sister is the overarching plot and is why Phryne is compelled to investigate and help others in peril. The writing is fine, although the first two episodes aren’t really challenging to an experienced mystery reader/watcher. I knew the culprit of the first murder fairly early and the second episode took me only slightly longer to guess. 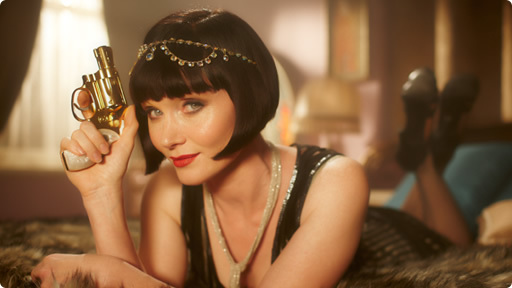 I’ll continue to watch Miss Fisher solve her mysteries.